It’s beginning to look a lot like...yes, it’s getting closer and closer to Christmas, and, for some of us, to that amazing feat of imagination and organisation that is hosting Christmas dinner. Whether you have five guests or twenty, a lot of planning goes into achieving perfection on the day. Follow our guide to the perfect Christmas feast, featuring sumptuous products from John Lewis and Partners and get every detail just right, from preparing swoon-worthy festive dishes to creating a dazzling table setting. Psst...preparing Christmas dinner can be easy and pleasant – just make sure your cookware is fully up to the task. A high-quality slow cooker or roaster is a must, and will ensure that you can leave your bird and veggies to do their thing without having to nervously check on them every ten minutes. We think nothing beats the outstanding quality of Le Creuset cookware, from their signature oven dishes to the 3-Ply Saucepan Set. Trying to have a healthier Christmas? Have a look at the Eaziglide Neverstick2 roaster, which will cook everything to perfection without the need for butter or oil (we promise, with this one, you won’t miss it). Now, while cookware makes a huge difference to the quality of your Christmas feast and the ease of preparation, a great oven and hob are absolutely essential, especially if you have multiple things on the go. In fact, the prospect of cooking up a storm over Christmas is an excellent reason to upgrade your oven and/or/hob. What should you be looking for? Our advice is to get an oven that has as many smart features as possible – it will save you time and backache checking on everything multiples times. Our pick is the AEG BPE842720M Built-In Single Oven - it features an integrated probe that will measure the temperature of your food without you having to open the door and a self-cleaning mechanism which will save you the scrubbing afterwards. The food is only half of the pleasure of festive dining; a beautiful table setting is the other half. Whether you’re going for a traditional table decorating scheme, or are experimenting with a bold, contemporary design this year, our top tip for a stunning table setting is embracing colour. 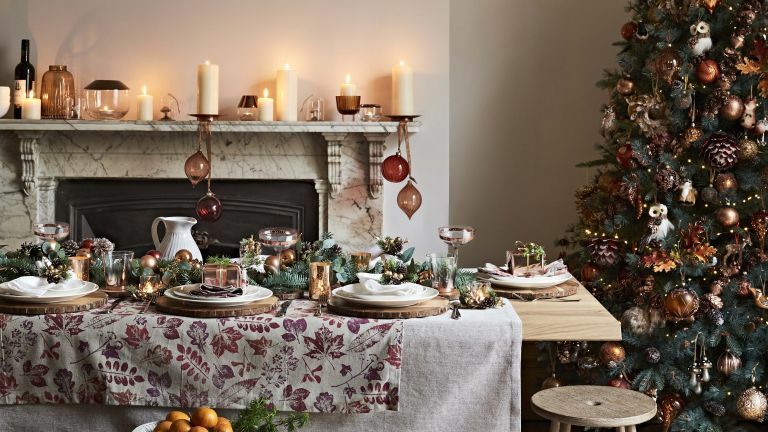 John Lewis & Partners have a stunning – and wonderfully varied – range of festive tableware in jewelled colours, from the luxurious and opulent Emerald and Gold themes to the simple and elegant Jet and Moonstone collections, that will make any Christmas table look opulent and inviting. If you were to only invest into a single, statement piece of tableware, you can’t go wrong with the dazzling Glitter Oval Centrepiece in Gold. And if you’ve been thinking about a brand-new dinnerware set, you can’t go wrong with the twelve-piece Luna Dinnerware Set. Gorgeously understated and luxuriously finished with a subtle ridge, it will see you well beyond Christmas. Need more help pulling it all together in a finished look? Take advantage of the Colour My Christmas: Table Styling Talks running at select John Lewis & Partners stores between now and early December. Find out more about how to attend. When it comes to any celebratory dinner, but especially the Christmas feast, the devil is in the finer detail. Relax for a couple of minutes, look around, and think about the small additions to the table that will really take your dinner party to the next level. How about festive and colourful barware (think mixing those gin cocktails with flare), or sophisticated table decorations? And, of course, no Christmas dinner party is complete without Christmas crackers. For a perfect, coherent table setting, try mixing and matching Copper Wine Charms and crackers and baubles in a warm, amber tone. Christmas is the time to go all-out on the quality of your tipple – now is the time for your novelty gins and finest Prosecco. And if you can have both at the same time, even better. We love the Edinburgh Gin & Prosecco set by Raphael Dal Bo. It comes with three gin-based liqueurs that can be mixed with the Prosecco for delicious festive cocktails. Exclusive to John Lewis & Partners. Now that everything is ready, don’t forget about a musical accompaniment to your feast. A wireless speaker, such as the Sonos One Voice, is the best option for a dinner party, since it will allow you to easily control the volume and change songs while you are juggling other tasks. If you’ll be moving the party into a different room later, it’s a good idea to have a portable speaker, such as Ultimate Ears BOOM 3 Bluetooth Waterproof Portable Speaker. Who knows, if the fancy takes you, you might even want to continue the fun out in the garden – easy with this sturdy, waterproof number. It also allows multiple people to connect to it via their phones, so that everyone get the chance to play their Christmas favourite.